Jenny has joined us for après-ski beers in the warm afternoon sun as we gaze back up at the colossal, neck-craning views of La Meije, France’s most infamous ski area. Its peak (just shy of 4,000m), jagged séracs above enormous hanging glaciers and gaping bergschrunds, lie out and up in front of us like a painting. “But he wasn’t roped in,” she adds in afterthought. Buddy Kevin and I look at each other knowing what the other is thinking: imagine doing that sphincter-tightening traverse freestyle—gulp! I’ve never written a story back-to-front before but I like to lead with a good anecdote. And since our traverse into Pan de Rideau, one of La Meije’s most infamous routes, will remain with me always, it’s an easy write. You know how it is when you take a photo and it’s never as steep as it felt? Not at La Meije. Looking back at my shots now, there’s plenty of steep. Or super steep in the case of Pan de Rideau. Kevin is actually only 44 but he joined the Over 50 Club that day last March—skiing a slope steeper than 50 degrees, that is. 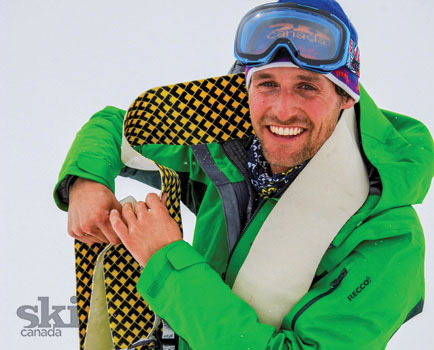 Now, as we look down at the monstrous north-facing pitch, Benji Ribeyre, our 27-year-old mountain guide, reminds us how difficult it is for some super-steep slopes to get snow-loaded because they’re sluffing constantly. For which we are very grateful. The beauty of Kevin’s and my timing after the storm is that each kick-turn on this wide-open elevator shaft buries us from knee- to waist-deep, making an orchestral-like rhythm possible as one by one we drop our way down this crazy spectacular slope. Benji guesses there have been about eight or 10 people ahead of us since La Meije opened after the storm. Apart from the traverse in, you wouldn’t know it, though. 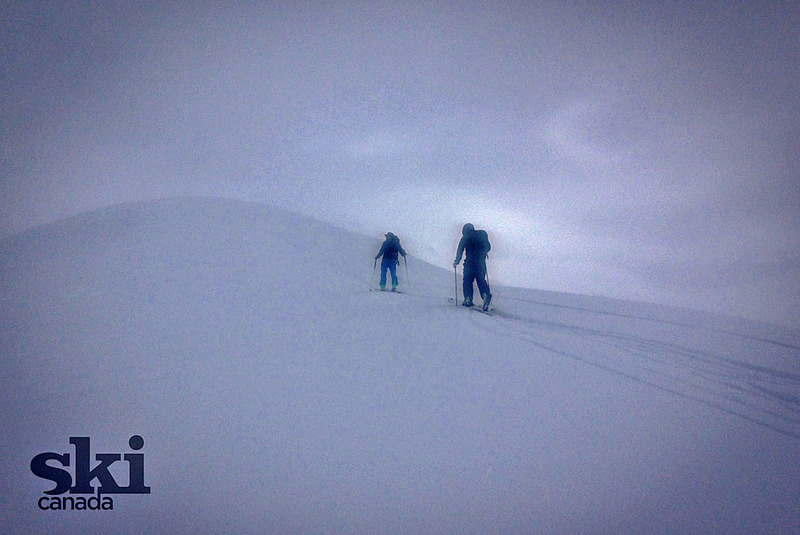 Our skis set off so much sluff that every turn and track that lies ahead is filling in before we arrive. Surreal. Final instructions are dispensed as Benji ties his climbing harness to Kevin’s and then to mine, leaving 15 metres or so of rope between each of us. He announces this will be his 61st run down Pan de Rideau. “There are only two routes here that I count runs on,” he tells us, “the other one I have done six times.” Without asking the name of “the other one,” Kevin and I have already decided there is safety in numbers here. But before we get to Pan de Rideau, we have to traverse what looks almost like a vertical wall, hence the need to be roped in. Our first instruction: “If the rope is not tight, you don’t move forward.” I have visions of freezing and having to be pulled like livestock into the abattoir. Benji continues: “And don’t take speed because if you do, and you hit a rock, you will fall in the “Y” Couloir, which is not good.” (Remember, this is all before we’ve heard about Jenny’s husband’s tumble into the hospital on the same face.) And finally, “Make sure there is no snow under your shoes when you put your skis back on.” Oh yeah, we have to climb down into this thing before we put on our skis. Near the entry point, Benji, in the lead, clips into a piton in the rock and moves slowly out onto the two-ski-width traverse. His left hand holds both poles, with his right hand and elbow running along the wall of snow on his way to clip into the next piton, at which point Kevin will proceed. My job in the caboose is to unclip our train at the right time. I think of my ski buddies Holly and Trevor missing all of this. I suddenly realize that there’s no way I can take photos. 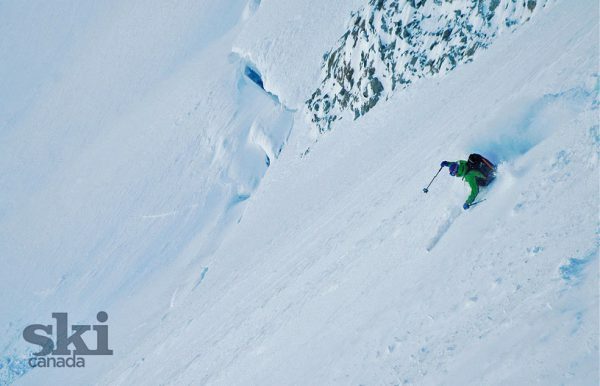 • La Meije is a one-lift, 100 per cent off-piste, experts-only, non-patrolled ski area. 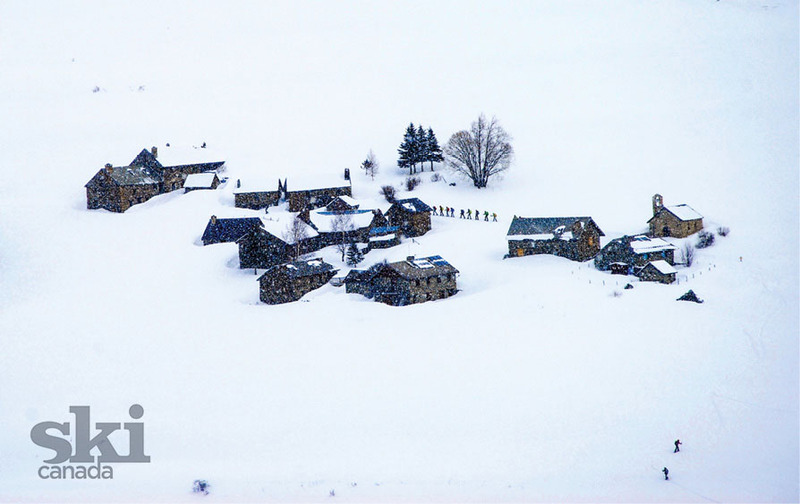 • La Grave is the medieval stone town; La Meije is the mountain and ski area opposite. • Lift-accessed runs are around 2,100 vertical metres, but you can push that to almost 2,400m if you taxi home from somewhere like St. Christoph in another faraway valley. • Despite all this dour stuff, if you can ski a black diamond, certainly double-diamond, at home, there’s a broadly defined “main route” down (on a sunny day) that you can manage quite easily without changing your pants. And loads of skiers do so without a guide. For everywhere else, a guide is STRONGLY recommended. • If you’re not a double-diamond skier, there’s plenty of uncrowded, well-groomed terrain and views for beginners and intermediates at the community ski area Le Chazelet (day pass: €16.50, five lifts) as well as even more off-piste for freeriders and those with their touring gear. Views of La Meije and its glacial glory are spectacular. • Go for a walk and stay a night (or two) at the Refuge du Pic du Mas de La Grave—Chez Polyte, €30-50 includes half-board. With the long overhanging eaves of Chez Polyte (aka Refuge du Pic du Mas de La Grave), our lovely port in a storm, it’s hard to tell when we wake up how impossibly opposite the weather is today until Kevin opens the door to spectacular and calm bluebird skies. Apart from our three sets of tracks behind the hut, laid out after 6:00 p.m. last night, nothing but untouched deep powder lies about as far as we can see. Not only has the storm passed, Benji announces that after four days La Meije’s old-school tele-cabin is finally opening today. We wolf down our müsli and toast, chatting with owner-proprietor Denis about the history of this painstakingly rebuilt-from-ruins stone chalet, then begin to suit up. I notice my pants fit a little looser today. After a couple of hours of skinning and skiing back to Benji’s car, we’re queuing up with the crowd (or as big a crowd as La Meije ever gets) of almost 100 per cent type-A males in full freerider kit, all champing at the bit. After the silence and solitude of the last 24 hours in the backcountry, it feels as if we’re back in the big city. There’s no time for lunch. The yellow light is flashing as we exit our little gondola and head off toward the 45-minute skin track that leads to the exit for Pan de Rideau. Partway up I suddenly bonk in hunger then realize in horror that I’ve left my pocket zipper open and both of my hardboiled eggs that I’d scoffed at breakfast are missing. Yesterday’s 5,000-calorie burn has caught up with my diminutive body, and I arrive 20 minutes behind the others. Okay, so technically, it wasn’t a full day of terror but the “utter exhaustion part” came from the storm and whiteouts that we found ourselves in when the weather changed, in combination with Kevin’s 130mm heavy boats under each foot, his corpulent alpine boots and a pair of touring bindings that weighed as much as his boots. Our plan to ski and skin back up a few slopes in this enormous randonnée playground just beyond La Grave turns into an all-day slog inside a Ping-Pong ball. We keep to ridgelines and safe areas where we understandably couldn’t enter slopes halfway up in such unstable conditions. From my evening notes before passing out under my duvet: “I’ve never really had a full-day of touring before,” says a weary Kevin from the top bunk. “In fact, I think the longest I’ve ever skinned up was about 30 or 40 minutes.” We had reached the mountain hut at 6:20 p.m.
And so it begins. 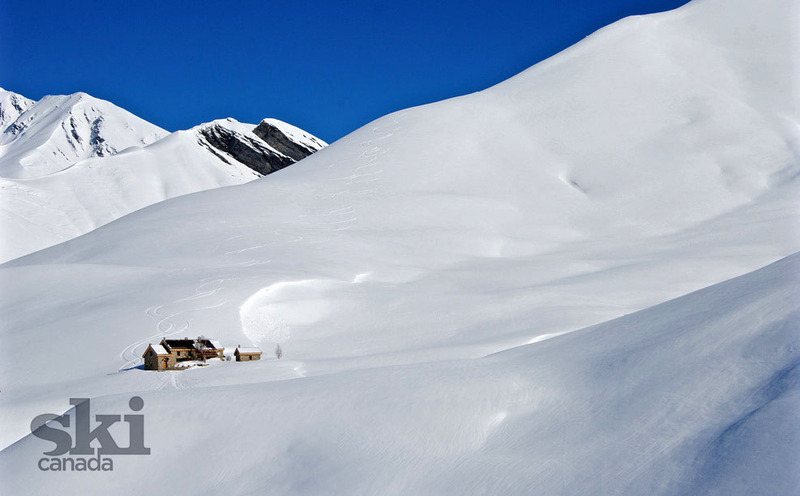 Whether you have your guide for the week or a weekend, La Grave is an easy add-on to an existing itinerary at one of countless ski areas in the Rhônes-Alpes south of Grenoble, Piemonte or Aosta Valley, Italy, or anywhere in western Switzerland. I mentioned this idea to buddy Kevin from Vancouver, who had signed up for a Ski Canada Readers’ Trip to a Club Med all-inclusive week in Les Deux Alpes last winter, and after a few emails with Jenny we were making the 20-minute drive up the road. Les Deux Alpes to La Grave is like Whistler to Rossland—worlds apart and a rewarding comparison, to say the least. 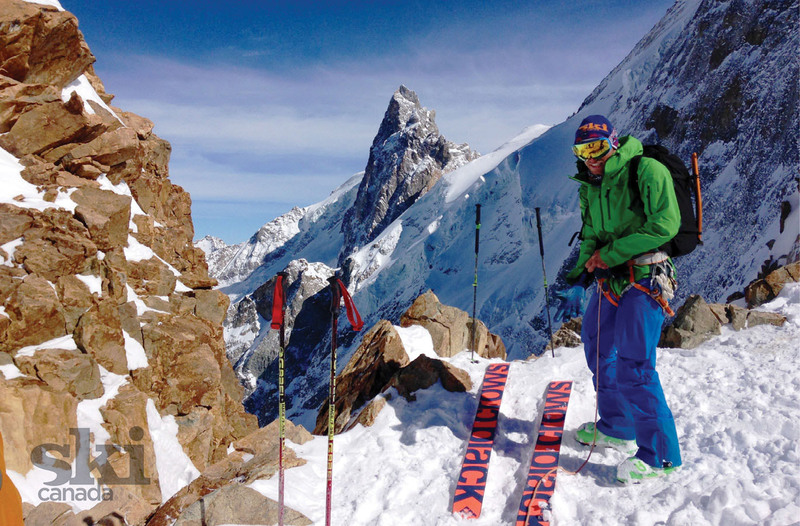 La Grave remains a pilgrimage that all good skiers in the world need to make at least once (or twice) in their lives.